I am finally ready to part with some of my journals. Apparently it is now a necessity. The shelves are bulging, and I am not allowed any more shelves! I have a number of projects ready to take to an Artisan Fair but thought I would share them here first as I have had a number of enquiries about purchasing. If you are interested in purchasing please email me at thepaperaddiction@xtra.co.nz I will not add a Buy Now button in case they sell at the fair first. It is first in ...wins. 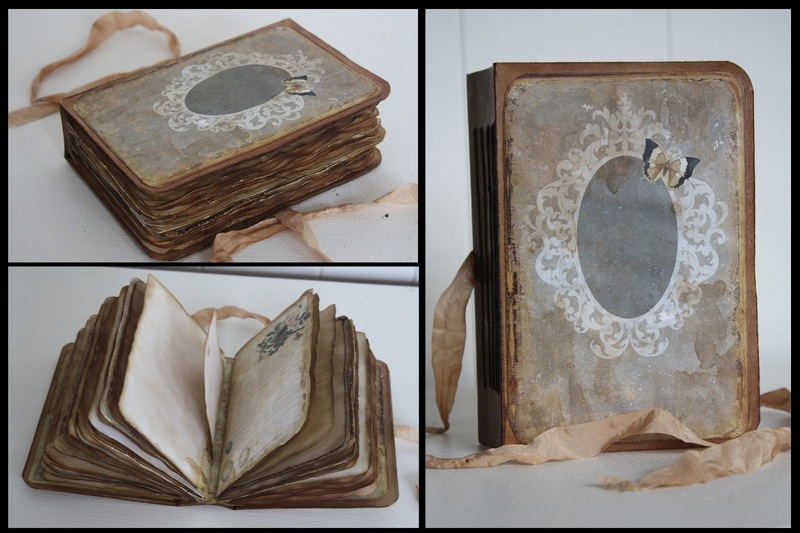 I couldn't resist the side views - the binding and the insides!! The Tabby Journal has lots of tags and approx 100 pages with envelopes and tucks galore. Paper used are digital downloads from Marion Smith and plain tea and coffee dyed papers. Covers approx 5 x 6 1/2" Inside pages are 4 x 6". Also included extra kraft tags and tabs for you to add in. The cover of the Pink Roses Journal is 6 x 4" the inside pages are 5 1/2 x 3 3/4". Inside pages are Marion Smith downloads and kraft paper. Approx 100 pages. 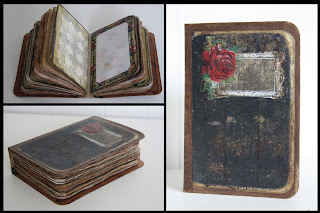 The Black Rose Journal cover is 6 x 4" the inside pages are 5 1/2 x 3 3/4". 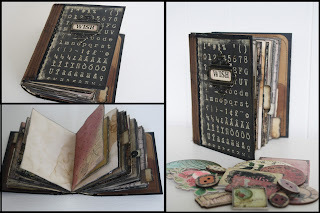 Inside pages are Marion Smith downloads and inked and grunged paper. Approx 100 pages. 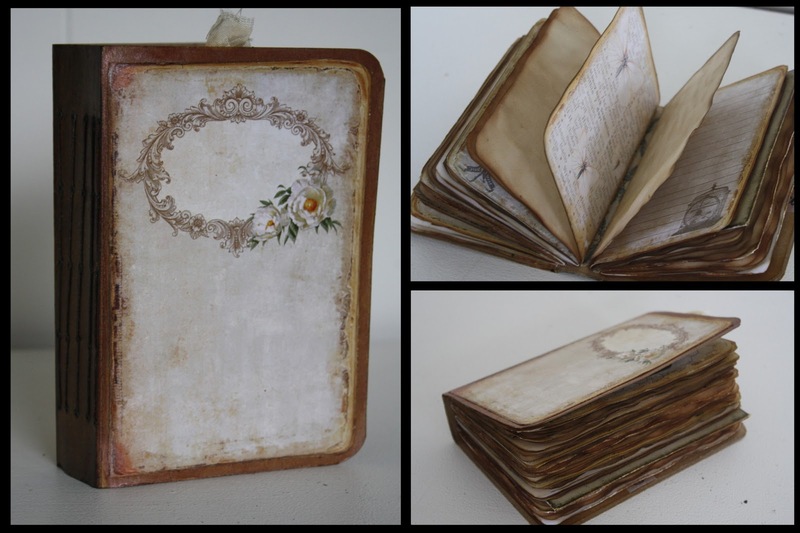 The Taupe Rose Journal cover is 6 x 4" the inside pages are 5 1/2 x 3 3/4". 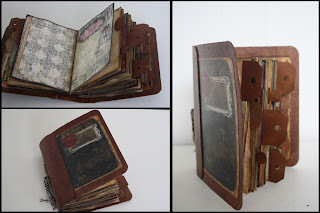 Inside pages are Marion Smith downloads and tea and coffee dyed and inked paper. Approx 100 pages. 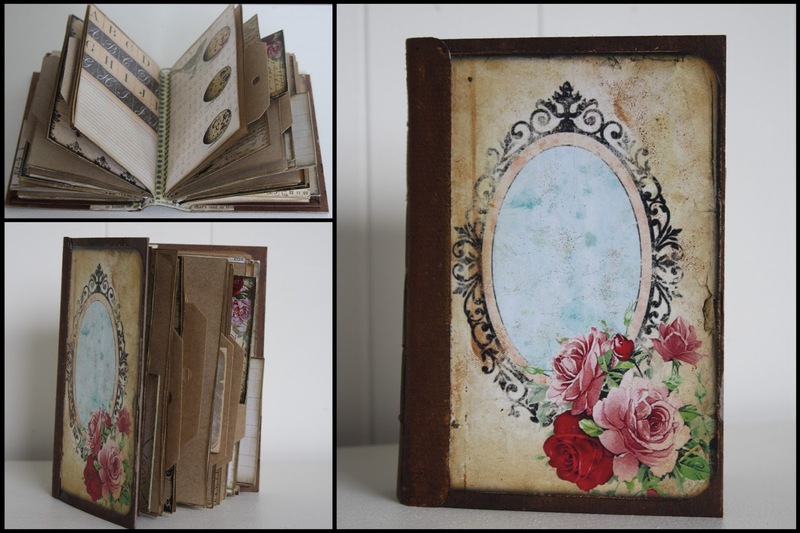 The Creme Rose Journal cover is 6 x 4" the inside pages are 5 1/2 x 3 3/4". Inside pages are Marion Smith downloads and tea and coffee dyed and inked paper. Approx 100 pages. 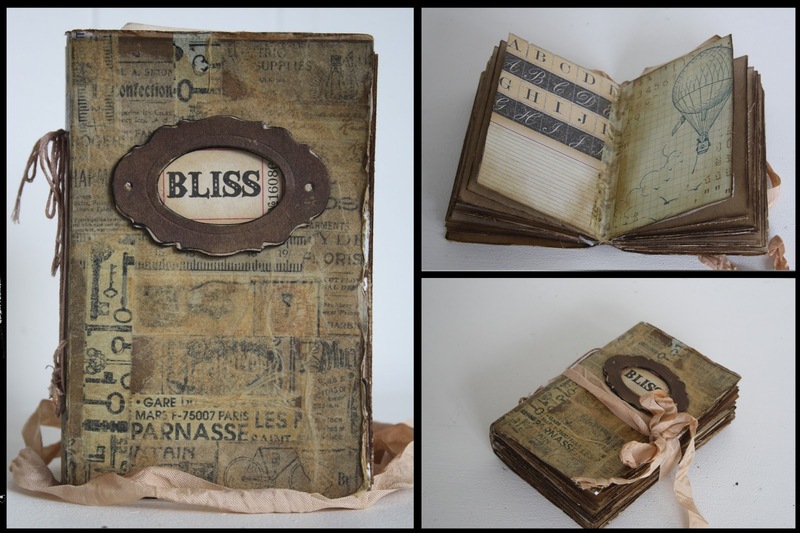 The Bliss Journal is 5 3/4 x 3 3/4" the inside pages are the same size. 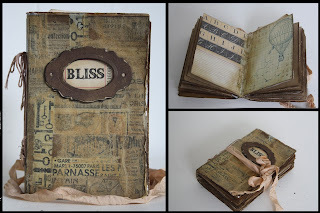 Inside pages are Marion Smith downloads and kraft paper. Approx 80 pages. ALL Journals come with a envelope of added ephemera included. They will all differ slightly but will include a minimum of 12 goodies. An example shown in the photo below. All the above journals are handmade by me. They fit into your hand or your bag and the measurements are approximate. They are ready for you to put photos in, draw, doodle, remember, write important notes and have fun with. Please Note Prices are in US Dollars as that is where the majority of my enquiries has been from. The shipping included will cover anywhere in the world. NZ and Australia purchasers please contact me on the email listed for an amended price as the shipping included will be discounted. Hope you like them - they are all rather delicious and I am hoping for loving homes to adopt them!! these are all stunners Michelle! Thanks Debi - I love them all! Your so incredibly talented! Each journal is absolutely stunning!